If you've ever eaten at Cracker Barrel, you've probably tried their delicious hash brown casserole! Whether accompanying a heap of bacon and eggs or a chicken fried steak, this casserole is simply perfection. It's salty, creamy, cheesy, and has perfectly crispy edges. Top it with a little freshly chopped parsley for brightness, and you've got a beautiful side dish for any brunch or Sunday dinner. You can also just eat a giant bowl on its own, it's that tasty. This dish is such a crowd-pleaser, grown-ups and kids alike will want seconds. You may even want to lick the entire casserole dish clean. It also freezes really well. You can make it ahead of time and throw it in the fridge overnight or pop it in the freezer for up to 3 months until you're ready to bake and serve it! It's perfect for your Easter brunch or dinner, as it pairs nicely with baked ham. Make it ahead of time, and have a stress-free day! Gather your ingredients. Preheat the oven to 350F. Finely dice the onion, then melt the butter in the microwave. Allow the butter to cool slightly. Whisk together the onion, cheddar cheese soup, cheddar cheese, yogurt, chicken bouillon, and melted butter in a large bowl. Mix until completely combined and all the ingredients have been evenly distributed. 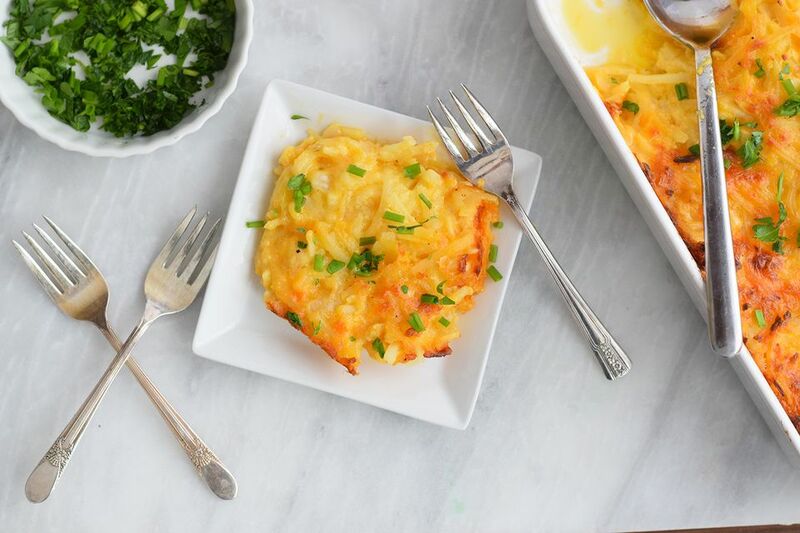 Carefully fold in the shredded potatoes, and mix until the potatoes are completely coated in the cheesy mixture. Grease a 9 x 13 inch casserole dish with cooking spray or butter, then pour the potato mixture into the prepared baking dish. Bake in the oven, uncovered for 45 minutes, until the casserole is bubbly and the top is golden brown. Cut and serve immediately, garnished with a little fresh chopped parsley. You can also serve it at room temperature. It's a great recipe for potlucks! Bacon: Add cooked bacon bits to the casserole and top it with more when it comes out of the oven. Spicy Jalapeno: Add a tablespoon of hot sauce to the mixture as well as a chopped jalapeno. Garnish with a little more diced jalapeno when it comes out of the oven. Smoky Sausage: Add 1 tablespoon of smoked paprika and 1 pound of cooked, chopped kielbasa sausage. Cheesy Broccoli: Add 2 cups of cooked, chopped broccoli to pump up the nutrition. Get creative and try out different flavors!